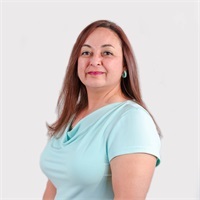 Leticia Mendoza | Mark J. Napolin & Associates, Inc.
Leticia Mendoza joined Mark J. Napolin & Associates, Inc. in 2011 as an Administrative Assistant and has since then evolved her duties to Office Manager, Account Operations Associate and Client Relations Manager. Leticia is also the point of contact for retirement accounts and 401(k) plan participants. Her previous career experiences in real estate and property management allowed her to obtain strong skill sets in various management and administrative support duties as well as superior customer service with an extremely kind, yet professional demeanor. Leticia has her Associate Degree in Business Administration with a concentration in Real Estate, has a FINRA Series 6 license and has passed the Series 63 Uniform Securities Agent exam. Leticia is a Registered Assistant of Royal Alliance Associates, Inc.
Leticia is a native New Mexican and spends her free time with her wonderful family and pets, enjoying the outdoors as much as possible, attending live music events and frequently participates with her church at Calvary of Albuquerque. You are welcome to contact Leticia with any administrative, office related, retirement accounts and/or for 401(k) participant resources and 529 account needs including scheduling appointments with any of our representatives.